You want to make better decisions. We want to arm you with the data you need to get there. Our team works hard during onboarding to get caught up with your existing processes. We look at your past books, we build a forecasting model and set of KPIs, and we do an audit of your financial statements/chart of accounts to make sure we’re all on the same page and getting started on the right foot. At Limitless Investment and Capital, we are very process-driven. To get the highest results, our Virtual CFO’s suggest they join your weekly director meeting. We often provide a 15-minute cash update or set aside time to chat about the company’s finances. This gives our Virtual CFO’s insight into your company and culture and helps us stay up-to-date on current events. 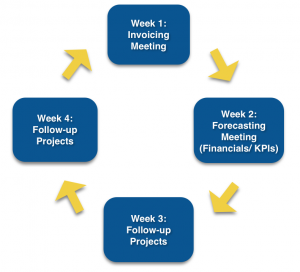 After the initial onboarding period, a typical month may include an Invoicing Meeting in week 1, a Forecasting Meeting in week 2 where we will go over the YTD financials and KPIs, and Follow-Up Projects weeks 3 and 4. We are committed to tailoring a schedule that fits each client’s specific needs although this schedule has worked best for many clients. We are always available during the month for questions, calls, and impromptu meetings. Additionally, if we are paying bills as part of the engagement, we will meet weekly for about 15-30 minutes to go over cash flow for the next two to six weeks. This is generally conducted with an individual team member, not the entire director team. Our dedicated bookkeepers will deliver financial reports and books that are always accurate, up-to-date, and tax-ready. Don’t worry about transferring your statements or payroll. We’ll sync with your bank accounts and credit card statements to begin the categorization and reconciliation of your transactions. We’ll manage your documents to make sure your accounts align, including transaction classification and any necessary adjustments you may need. Have any questions? Your dedicated bookkeeper is available for you at all times. Enjoy the feeling of clean, accurate books. And even better, books you didn’t have to manage. Your dedicated bookkeeper will close your books each and every month and deliver your financial reports on a guaranteed schedule so that you can make better business decisions.